In the bus. Actually it's well past 4:15. Probably 10:15. I lost my watch at the beach at Fuengirola. I went back and looked at where we were sitting and tried to recreate where I took off my sweater which most likely is when it happened. The watch had been taken up as tight as I could get it to go, having lost enough inches in my wrist it had become a problem, but with that done it stuck out enough it was easy to hit the end that stuck out some and loosen the watch to the extent it could fall off. When it got loose I would feel it, but taking off the sweater is the most logical explanation I can come up with for not realizing it had gotten lose. I did check with the hotel a couple of times and of course with the bus driver Anyway. We're nearly to Portugal, and the time will change there. I'm using the Ipod for a watch in the meantime. I considered some that were for sale for 5 pounds in Gibraltar, but I was in a hurry and didn't get back there to get one after taking care of the necessary stuff. The problem with doing the reports on gmail is that I can't go back and look at them right now to see exactly where the holes are. But I know where some are. Granada. It is named for the pomegranate plant, the Jewish name for it. The assumption is that after the first destruction of the Temple in Jerusalem (what? 500 BC?) some of the Jews came there in the original Diaspora and founded a very old Jewish community there. Very told I guess is redundant in the sentence. The Jewish section of the city is where Linda and I got lost. Well, to be honest, we had gotten out of the winding streets actually, back to the main street, the justice building where we saw a bag piper playing both before and after going into the Jewish quarter. But still, we did see it, and it certainly does have a warren of tiny paths, far too small to be called streets, up and down, stairs everywhere. It's a wondrous place, and I'm glad to have experienced it. Getting lost wasn't so fun. We had a map. But the print on the map was tiny and Luis had written through some of the important street names as we were talking with him about where to go and how to get there. We stopped and asked 3 times and had very helpful people, none of whom spoke much English, and I could ask the questions, just couldn't understand the answers as well as might have been appropriate. Finally we were tired and still lost and just took a taxi, and at 3 euros it was about the best investment of the trip so far. Linda tells me her sister Betty and I are among the smartest people she knows and we've both managed to get her lost in Europe. I told her starting out, though, that I have a lousy sense of directions but had a compass and could read maps well. All the statements are true. I'm not sure the compass works, but the statements were true. And Linda, bless her heart, thinks the compass is working when I've got it turned around so the needle is pointing at the N but that the rest of the time it's broken. I think sometimes the needle is not consistent no matter what letter it's pointing to. But then again, I've got a lousy sense of direction, so how would I know? The mountains in Spain have intrigued me. I didn't expect it to be this hilly. When we landed in Madrid, Linda commented it kind of looked like west Texas, and certainly it does to some extent. But that's just the area around Madrid, and nowhere else we've seen. The mountains are really quite prevalent and quite high. We went to a high point over Toledo to look down at the city, the point where El Greco painted landscapes of Toledo that still look just like the place. In Toledo the major stop was in the church where we saw the notable El Greco painting, and the animation with which the local guide described the painting, and the detail of knowledge, was impressive. It is a painting of a miracle that happened several (3) centuries before El Greco, where two saints including the first martyr Stephen, came down and carried the body of the count who was a good man and a benefactor of the church where he was buried down into the crypts. The bottom part of the painting is dark, Spanish in style, and has pictures of real contemporaries of El Greco (and of himself and his son) among the mourners. His wife is always portrayed as Mary, and she's in the top of the painting. Then the top part of the painting, Italian in style, is the ascension of the spirit of the count. Anyway, it was a neat painting, one I'd seen but paid no attention to it. The local guide ranked it up with Rembrandt's Night Watch and one other painting as the top three story-telling paintings in the world. The craft place there was interesting as well. They make a special kind of jewelry there of gold and steel, distinctive to Toledo. Toledo has made the swords of the world for many centuries, and the current swords for West Point are crafted there. The gold thread is hammered into holes in the steel, then in the curing the steel becomes black, and the gold is permanently embedded. They do some silver into the designs as well. They are doing some by machine now, but they still have masters who do it by hand, two of whom were sitting there in the room and we watched them work. Lunch that day was interesting. We had passed some of the windmills that inspired Cervantes in the Don Quixote tale. We're now almost in Portugal, in the town of Aracena which is the name of the mountains we've been going through. The houses are white with the orangey red roofs, little stair steps up and down the hills, all laid out under the church on the highest point. 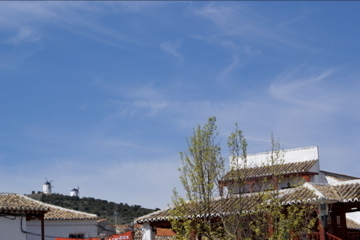 There's another hill with the Aracena Park Hotel and Spa now, a later touch. And as we keep going, it becomes much more prosaic, aka modern. We're out of the town now driving through bare trees, knotty, gnarly trunks. The little town where we ate lunch after Toledo, something like En Punto, certainly had a Cervantes theme. Not only the little inn, but even as I wandered around, one of the homes had curtains with that woven in. The inn had an old wagon, and others like that, replicas (the one in the inn could have been a replica too) The trees are oak trees, dead, probably because of last winter's freeze. Very hot in summer, very cold in winter. That doesn't make sense, for it to have a freeze that would kill that many oak trees. 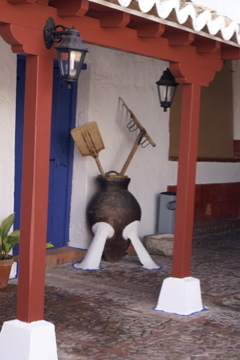 One thing in the restaurant that intrigued me but my pictures were poor was a pot with a very small base propped up on three sides by arms, kind of making the equivalent of a three legged stool. Okay, just two legs, leaning up against the wall. See? Weird. We're still 47 miles from Portugal. Kilometers. The olive trees. Yesterday in Seville for the Palm Sunday observations, people were carrying olive branches, not palm leaves. How appropriate! The trees aren't nearly so dominant here in the west of Spain as they were all over the area within 200 miles of Granada, but virtually EVERYWHERE you looked there were olive fields. The trees were kind of in clumps of 3 or 4 trees, more than 6 feet apart on all sides from the next clump. I had thought the trunks of the older ones were very very thick, then when I studied those obviously newer, they weren't just one huge thick trunk but were several small, thick trunks. The olives can be harvested with machines that shake the olives onto cloths spread under the trees, but the machines tend to damage the shallow roots so many of the farmers still do it by hand, hitting the trees with a rod. The crops from a field are good every other year, for it takes a year for the crop to grow back after being hit. Other frequent trees are orange trees, and those are everywhere in towns. 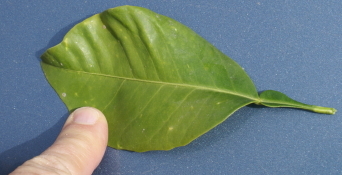 Two types of leaves set apart the different kinds of oranges, the leaves with the large leaf and a small one on the stem before the big leaf marking oranges not good for eating, bitter ones used for fragrances or marmalades. Those with just one lea on the stem are good eating. Citrus trees are not native to Europe but to the Far East from which they were brought to Spain and all other points! What else did we do in Granada? Of course the Alhambra. But first. Okay. Not much. We got to the hotel and shortly after arriving Linda and I did our walk, ending in the taxi ride getting back with that advantage in time for supper, and I ventured out again in crowded streets (Spain sleeps in the afternoons, not at night!) and was going back to an Internet café I though I could easily find but couldn't and didn't risk getting lost again. The next morning Linda got her hair done and I learned there was free wifi in the hotel and didn't go back out until the bus came about 10. Then we walked the gardens at the Alhambra before going inside at our appointed afternoon time. It was certainly impressive, and I think I was almost as impressed with the other places within the complex as with the most famous building. I do intend to get hold of Washington Irving's Tales of the Alhambra and read (or listen to) that. Granada is between two mountain ranges, and I didn't really ever get a good picture of the Sierra Nevada mountain on the south side. All the water for the Alhambra and for Granada comes from melted snow from there. The water system in Granada still is the medieval one which works quite well. Stork nests on virtually all the electrical poles! And some with storks in them, but they're on the other side of the bus and I can't get a picture of them. Hopefully that will be possible later! We're very close to Portugal and very close to our "hydralic break" so I'll shut this thing down. I'm in the room in Lisbon, found the free wireless internet while waiting for the luggage to arrive. It's here, so I'm gone.